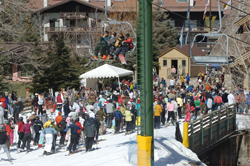 Warm weather and blue skies brought throngs of skiers to Bald Mountain on Sunday, the final day of the 2008-09 season. The closing weekend ski count of 5,406 was the highest ever, since data for the statistic began being recorded in 1995. How do you say faux pas in Austrian? Clearly, we cannot keep eating this way.